It is extremely uncommon to offer to the market a suit of armour of this nature. The armoured shirt is rare, with only a small group of such items known to exist. Its seven columns are each formed by arrangements of many small overlapping plates—each with an indented centre and a cusp along the lower edges—a hallmark of quality. At the back, there are a further five columns of these plates, while a large solid plate protects each of the warrior’s sides, one with an old repair. The sleeves are elbow-length. Below all of this a skirt of riveted chainmail hangs. However, the icing on the cake is the trousers—another pair is not known. 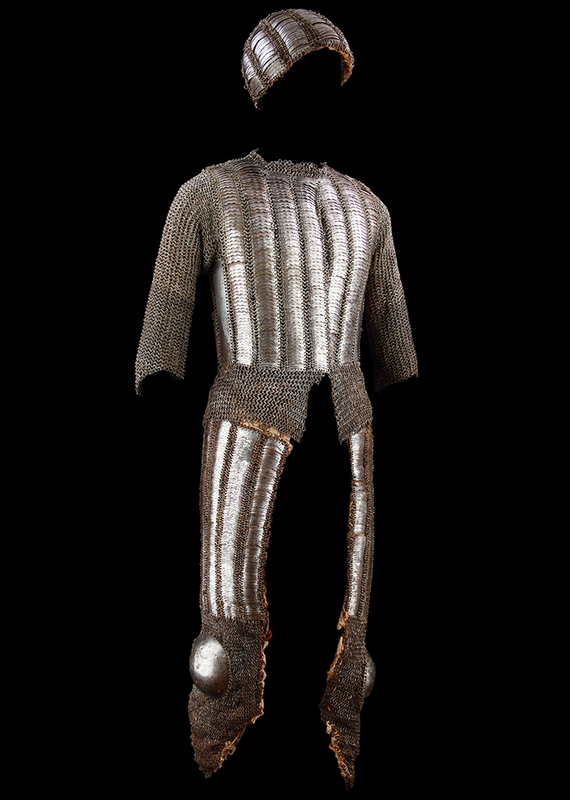 There are three pairs of mail-and-plate trousers known to us, but they are made of large, vertical, splinted plates that are connected by narrow rows of chainmail. One is in the Royal Armouries, Leeds (XXVIA 309). Our trousers partly follow this pattern too. Each leg has six long columns of small iron plates that protect the wearer’s thigh all the way down to the knee. Two of these columns have scalloped plates to match those in the shirt. Below each thigh section hangs a V-shaped piece of mail and a large knee plate with bat-shaped reinforcements applied to cover old areas of damage. All of this is attached to a 19th century cotton liner stuffed with camel hair. This has deteriorated over the centuries but is now protected with conservation netting and backed onto felt for mounting. Despite each of these elements being of identical 17th century Deccani manufacture, strictly speaking this set is a composite. Indian armouries did not, traditionally, keep ‘sets’ of armour: the shirts would have been kept separately to the helmets, and so on. However, we are quite certain that these three elements were de-accessions from the Bikaner Armoury in the early 1970s and, although there are no inscriptions on the metalwork recording this, there is very little doubt that they were part of the booty won by the general Maharajah Anup Singh (1669­ to 1698) in the Golconda campaign of 1687 or the Adoni campaign of 1689, on behalf of the Mughal Emperor Arungzeb (1658 to 1707). Provenance: formerly in the Bikaner Armoury, India, and then the notable collection of Eric Vaule, USA. B. Mohamed, The Arts of the Muslim Knight, Skira, 2008.